Dr Julio Aguado Perez obtained his PhD in March 2018 from the European School of Molecular Medicine (University of Milan) where he investigated the role of small non-coding RNAs generated upon induction of DNA damage (named DDRNAs or DNA Damage Response RNAs). He discovered that these DDRNAs containing telomere sequence are critical for both the assembly and maintenance of the DNA damage response foci at the telomeres and enable the recruitment of DNA damage factors to the damaged telomeres. This major scientific discovery published in 2017 in Nature Communications has greatly contributed to explaining how eukaryotic cells respond to life-threatening events such as the generation of DNA double-strand breaks in the genome. In the recent years, Dr Julio Aguado Perez has collaborated with the laboratory of Prof Piero Carninci at the RIKEN Institute in Yokohama (Japan), a pioneer in RNA deep sequencing technology that has permitted the creation of comprehensive maps of mammalian transcription start sites. There he led a project that resulted in the development of a new technology to enrich for non-coding RNAs combined with next-generation RNA sequencing. This cutting-edge work was recently published in the journal Nature Protocols with Dr Julio Aguado Perez as first author on this publication. This powerful technology has now enabled the study and characterization of non-coding RNAs and their putative precursors. 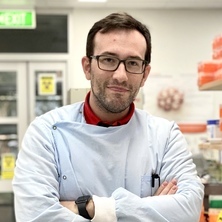 Dr Julio Aguado Perez currently works at the Australian Institute for Bioengineering and Nanotechnology (AIBN), where he holds a postdoctoral research position.